Back in August, the Web was shocked to see a movie trailer for A Christmas Story 2, a follow-up to the 1983 classic. Many thought it was a joke… but nope, this straight-to-DVD film was slated for Christmas 2012. The marketing materials went out of their way to denote that this was "The Official Sequel" to the original film. But that's a pretty big lie. The honor of being the sequel goes to 1994's It Runs in the Family, later renamed My Summer Story for the video market. Today's song, It Runs in the Family (Overture), featuring dialogue by Jean Shepherd as the narrator, illustrates the third type of sequel we outlined in the Introduction: Non-Christmas Songs/Shows/Movies that are sequels to Christmas Songs/Shows/Movies. It Runs in the Family featured the same director as the A Christmas Story, and continued to feature narration and stories from Shepherd, though due to the 11 years that elapsed since the original, the main characters were all recast (except for Ralphie's teacher, Miss Shields). It's not a bad film… but it bombed at the time of release. The stories and characters are familiar, but it's not a Christmas movie, which is probably what audiences were seeking. During today's excerpt, you can hear how they try to summer-oriented sequel back to the holiday origins of the first. MGM was responsible for the original A Christmas Story, as well as It Runs in the Family. However, the new direct-to-video A Christmas Story 2 is a Warner Bros. production. If I were to guess, Warner licensed the name and characters from A Christmas Story to create their spinoff, thus why they are pushing so hard to proclaim that it's the true successor to the film. Of course, director Bob Clark isn't involved, and writer/narrator Jean Shepherd has been dead since 1999. It's a cash grab. Avoid. 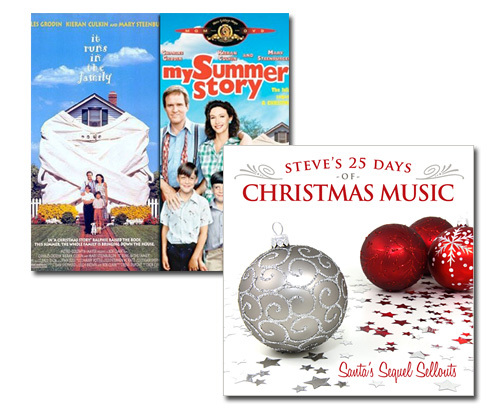 New to Steve's 25 Days of Christmas Music? Take some time to read the explanation and introduction!